This process removes (or extracts) linear events falling between specified dipping angles. The Dip Filter process is based on the optimum velocity filtering theory presented in Sengbush and Foster (1968). It essentially performs a multichannel deconvolution. Compared to filters which are controlled only by a dip cut-off, these "optimal" filters have increased flexibility. They provide control over the power spectrum ratios for specified dip ranges and allow increased noise suppression in regions of f-x space. The relative scale of the input and output for various dips governs the filter. Dips are attenuated in proportion to the relative difference between the input and output statistics. It is not a data-dependent filter. The trace-to-trace variation of the signal does not affect the filter computation. Using a noise fan and the signal/noise ratio, statistical models are calculated for the input, the noise and the desired output spectra in the f-x domain. The output models are defined to reduce (or preserve) the amplitudes for a range of dips relative to the input model. A collection of filter coefficients is derived from the models using the complex Wiener-Levinson algorithm. The filters are applied to the data in overlapping horizontal windows. Sengbush, R. L. and Foster, M. R., 1968, Optimum multichannel velocity filters: Geophysics, v. 33, p. 11-35. 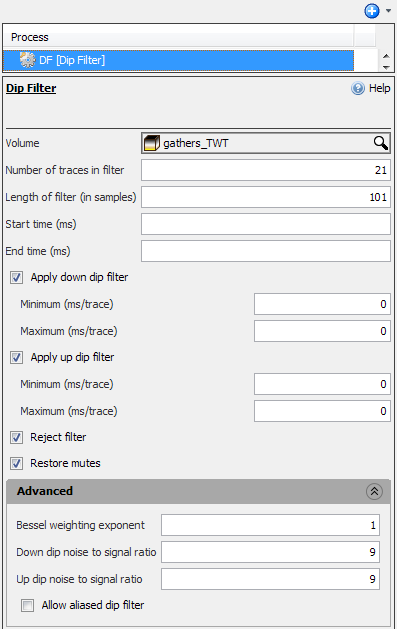 Select Dip Filter and type a name for the process. In the Details Panel, select an input gather volume for the process. Number of traces in filter — The number of traces in the filter. This value must be odd. Length of filter (in samples) — The length, in samples, of each trace in the filter. Start time (ms) — The start time, in milliseconds, for filter application. Leave it blank to begin at the start of the record. End time (ms) — The end time, in milliseconds, for filter application. Leave it blank to end at the bottom of the record. Minimum/Maximum down dip (ms/trace) — The min/max extents of the down dip. The filter will reject/pass dips outside this extent. All values must be non-negative. Minimum/Maximum up dip (ms/trace) — The min/max extents of an up dip. The filter will reject/pass dips outside this extent. All values must be non-negative. 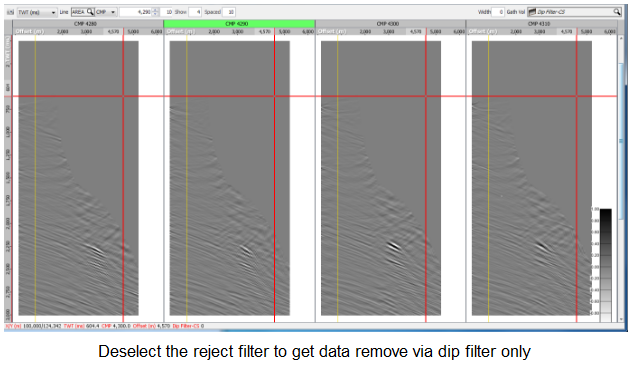 Reject filter — If checked, the filter will be a dip reject filter. Otherwise, the filter will be a dip pass filter. Restore mutes — If checked, the top and bottom mutes from the input volume will be restored on the output. Bessel weighting exponent — Exponent of the spatial Bessel weighting. Up/Down dip noise to signal ratio — Magnitude of dipping noise relative to magnitude of signal. 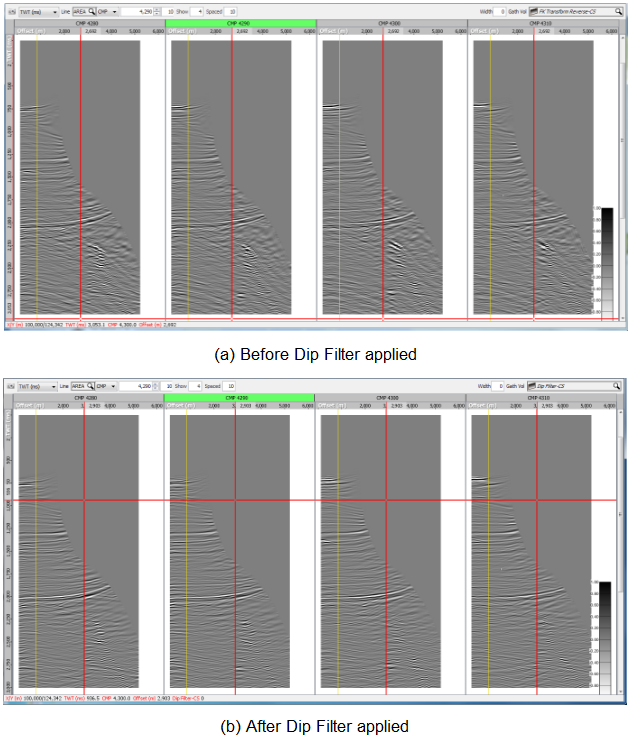 Allow aliased dip filter — If checked, the dip filter will allow aliasing.